The Prime Minister, Shri Narendra Modi addressing at the Golden Jubilee Year Celebrations of the Institute of Company Secretaries of India (ICSI), in New Delhi on October 04, 2017. 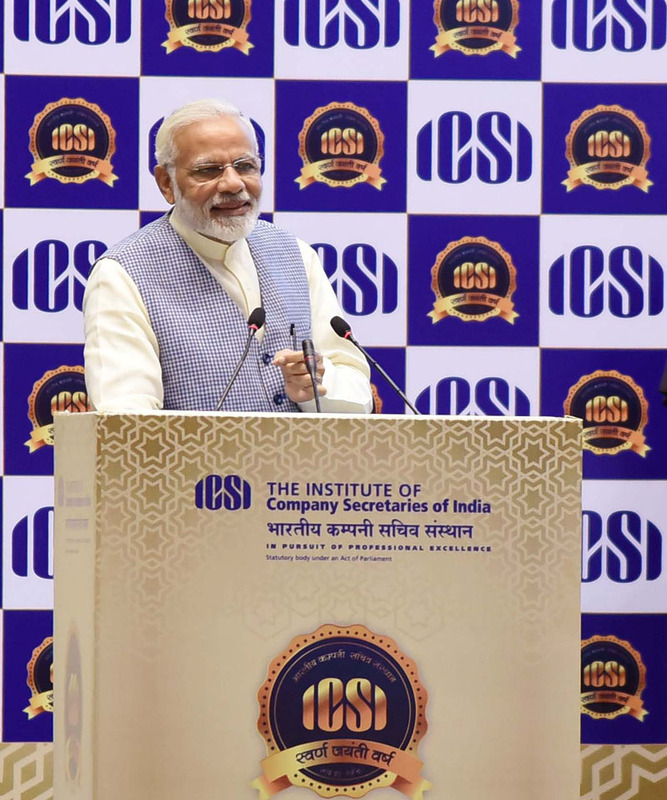 New Delhi: Prime Minister, Shri Narendra Modi, today addressed Company Secretaries at the inauguration of the Golden Jubilee Year of ICSI – the Institute of Company Secretaries of India. On this occasion, the Prime Minister congratulated all those associated with ICSI. He said he is happy to be among those who are responsible for ensuring that companies follow the law, and maintain their accounts properly. He said their work helps establish the country’s corporate culture. Their advice has a bearing on the country’s corporate governance, he added. The Prime Minister said that there are a few people in our country who attempt to weaken the honesty of our social structures, and lower the nation’s dignity. He said that the Government is working towards cleansing the system of such elements. The Prime Minister said that as a result of the efforts of the Government, the economy is functioning with less cash. The cash to GDP ratio has come down to 9 per cent, from 12 per cent before demonetization. The Prime Minister cautioned against people who only wish to spread a feeling of pessimism. The Prime Minister recounted instances in the past when the growth rate had fallen below 5.7 per cent, witnessed in the last quarter. He said that low growth rates, on those occasions, had been accompanied by higher Inflation, higher Current Account Deficit and higher Fiscal Deficit. 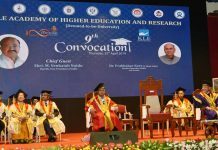 The Prime Minister said that there was a time when India was considered to be part of the Fragile Five economies, which were dragging back global recovery. Acknowledging the decline in growth in the previous quarter, the Prime Minister said that the Government is committed to reversing this trend. He said several important reform related decisions have been taken and this process will continue. He asserted that the country’s financial stability will be maintained. He assured the gathering that the steps taken by the Government will take the country to a new league of development in the years to come. He said that a premium would be placed on honesty, and the interests of the honest would be protected. The Prime Minister outlined the massive increase in investment and outlays in some key sectors over the last three years. He said that 87 reforms have been carried out in 21 sectors in this period. He presented figures to show the quantum jump in investment. The Prime Minister said that in the policy and planning of the Government, care is being taken to ensure that savings accrue to the poor and the middle class, even as their lives change for the better. The Prime Minister asserted that as he works to empower the people and the nation, even though he faces criticism on some occasions, he cannot mortgage the country’s future, for his own present.